Y’all, the weather today! Could it get any better? Please, please go spend some time outside to welcome this fantastic fall weather. This is just as it should be as we head into the Thanksgiving season. Remember we won’t be delivering next week, but we’ll pick things back up the week after Thanksgiving. The first frost is coming! I can’t believe it, but I am actually excited for it this year. Lots of crops continue to grow through light frosts- broccoli, cabbage, kale, lettuce, etc. so the frost doesn’t mean an end to the CSA, but the frost is symbolic of the end of the production season approaching. I think Justin and I are both welcoming of winter this year. The 2015 growing season has been tough with spring flooding, a tornado, awful summer drought, then again more flooding in October. We have two other East Texas farm friends who decided recently that they need to take a break from farming for a few years to financially and/or emotionally recover after how rocky the year has been. We can totally relate. When the weather is bad a farmer has to work twice as hard to get half the yield and it wears on you. But we’ve been fortunate to have our farm members supporting our farm through the CSA. Your commitment to local agriculture through thick and thin really made this year do-able for us. I head into the Thanksgiving week truly thankful for each of you. So with the frost coming this Saturday, we’ll be spending Friday harvesting as much of the tender crops as we can- the winter squash, green tomatoes, eggplant, etc. have to get out of the field as it’ll all be wiped out in the frost. A fast paced harvest to beat the frost is a lot of fun, actually, so if you have 3-4 spare hours on Friday morning to come help, drop me an email and let’s arrange it! Acorn Squash—This week everyone received a nice sized Acorn. You can store this crop at room temp for several weeks, but I suggest you make a squash soup right away. So yummy. Delicata Squash—This week the small shares are the envy of all the chefs we work with: you received the wonderful delicacy: the Delicata Squash. Scrub the dirt off the peel and slice into round rings. Drizzle with just a tiny bit of olive oil and salt, and bake in a metal pan (for better browning) until golden. The peel is quite tender after baking, so you can just dig right in. 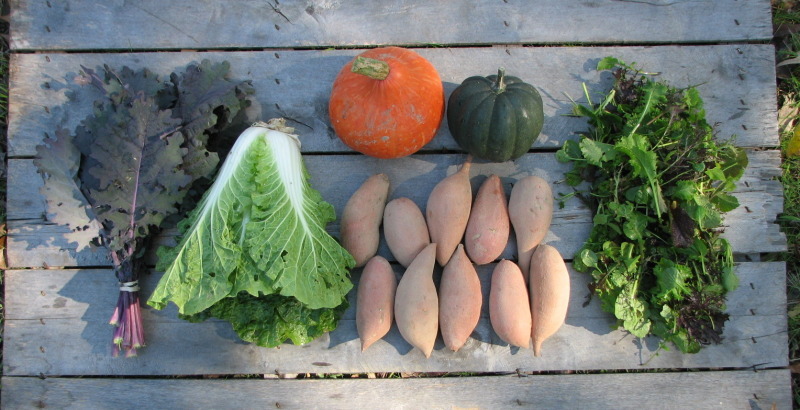 Farmer’s Choice winter squash—The large shares are sampling an array of the winter squash we have out in the field. You might have a Butter Cup, Long Island Cheese Pumpkin, or Potimarron (a French Heirloom- vive la France!). Will yours be savory or sweet? Buttery or chestnutty? Will you make squash muffins or stuffed squash? Google the unique details about your variety to learn more. Sweet Potato—Enough for a crowd, as we know you’re all probably making sweet potato casserole next week! Asian Field Greens—Our custom mix of frost tolerant and tender greens. The mix includes 6 varieties including Green Frills and Scarlet Frills, Asian mustards- Mizuna, and Minutina, and two mild Asian greens, Hon Tsai Tai and Komatsuna, which are a bit like broccoli raab or boc choi. These combine into an eye catching mix of flavors and textures on the plate and are suitable for using in salads or for braising or roasting. Napa Cabbage—This beautiful, huge vegetable is in the same family as Mizuna, and Tatsoi (some of our Asian greens). It is great cooked or raw, in a soup, or however you’d use cabbage. Everything will need a gentle washing before cooking, but leave the dirt on until you’re ready to use them. As a general rule, wait to wash any veggies until you’re ready to use them to help retain nutrients and prevent spoilage from excess moisture. Any bruised or nicked produce should be eaten quickly as it will begin to spoil faster. We’d love to hear stories and recipes of your culinary adventures. 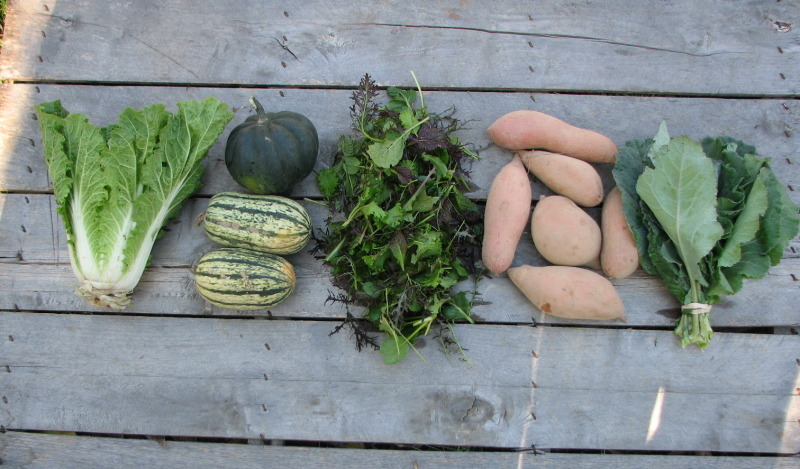 Post a comment of how you’ve used your CSA share, or tag us in your facebook and instagram posts! Show us and your fellow members how you’re using your share of the harvest. Large, from top left: Red Russian kale, Napa cabbage, farmer’s choice winter squash (pictured here, Potimaron), large acorn squash, sweet potatoes, and mixed Asian field greens. Small share from left: Napa cabbage, small acorn squash, Delicata winter squash, mixed Asian field greens, sweet potatoes, and collard greens. I am totally about to try this recipe with my buttercup squash! Pray it turns out as amazing as it looks.